The Linksys WRT1200AC AC1200 Dual-Band Smart Wi-Fi Wireless Router is a simultaneous dual-band 2 x 2 Gigabit router, which supports 256-QAM modulation, allowing a maximum data rate of 400 Mbps on the 2.4 GHz band and up to 867 Mbps on the 5 GHz band. It has one (1) USB 2.0 / eSATA combo port, and one (1) USB 3.0 port. It has two (2) high-performance external detachable antennas for enhanced dual-band communication, maximum signal strength, better coverage and range. IMPORTANT: The firmware for Linksys WRT1200AC v1 is NOT compatible with Linksys WRT1200AC v2 or vice versa. Check the label to know the product’s version. If it shows WRT1200AC v2, use the v2 firmware. If the label just shows WRT1200AC, use the v1 firmware. The 2.4 GHz Network caters to devices in your network that use 802.11b, 802.11g and 802.11n. The 5 GHz Network works best on devices that use 802.11a, 802.11n and 802.11ac technologies. The 2.4 GHz and 5 GHz Guest Networks. These additional wireless networks allow your visitors to only have access to the Internet but not on your local network (i.e., shared storage devices and printer access). For your connected home, you may take advantage of the 2.4 GHz network to connect your wireless devices into to surf the Internet, use email, share files, and print. The 5 GHz network is best for heavy applications including Voice over IP (VoIP) devices, online gaming and high-definition streaming. Built-in USB 3.0 and one (1) Combo USB 2.0 / eSATA ports that can easily add Gigabytes of storage space to your network by connecting an eSATA drive or USB flash disk. You can also connect a USB printer to either of the ports. However, you can only connect two (2) devices (one for each port). This router supports FAT, NTFS and HFS+ file systems. You can easily set up and manage your router, devices and wireless network with Linksys Smart Wi-Fi Account. Alternatively, you can configure the advanced settings on your router via the Local Access link. To know more about this, click here. 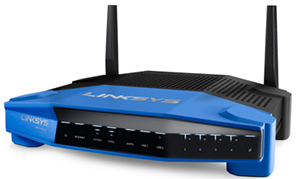 The Linksys WRT1200AC is powered by a Marvell® Dual Core 1.3 GHz CPU for unparalleled speed. The Linksys WRT1200AC is DLNA CERTIFIED® for home media management. It is also wall-mountable to ensure flexibility. For instructions on how to wall-mount your router, click here. Setting up the Linksys WRT1200AC is made fast and easy because of its CD-less setup. Now you can run the setup from a web browser. To know more about this, click here. 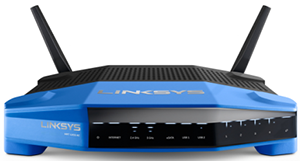 NOTE: Visit the Linksys WRT1200AC Product Page to read more troubleshooting articles, downloadable user guides or firmware updates and other support information related to this product. Adjustable External Antennas - This router is shipped with two (2) adjustable external antennas that should be connected to the router before powering it ON. To connect the antennas, twist the antenna connector clockwise into the antenna port on the router. NOTE: The antennas are adjustable to customize your wireless signal for single or multi-story buildings. These are also removable to accommodate upgrades. NOTE: You can also upgrade your Linksys WRT1200AC’s external antennas for enhanced wireless range and coverage in your single-story home by installing the Linksys WRT High-Gain Antennas, WRT002ANT and WRT004ANT. Click here to know more. 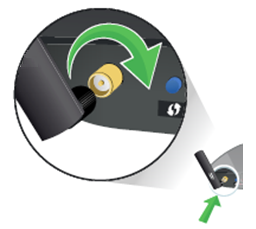 Wi-Fi Protected Setup™ button - Press this to easily configure wireless security on WPS-enabled network devices. 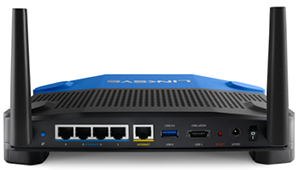 ETHERNET ports - Use Ethernet cables to connect wired devices into these blue Gigabit (10/100/1000 Mbps) ports. NOTE: For best performance, use CAT5E or higher-rated cables on the Ethernet ports. INTERNET port - Use an Ethernet cable to connect a broadband Internet Cable / DSL or Fiber optics modem into this yellow Gigabit (10/100/1000 Mbps) port. NOTE: For best performance, use CAT5E or higher rated cables on the Ethernet ports. USB 3.0 - Connect and share a USB drive or printer on your network or on the Internet. USB I eSATA - Connect and share a USB or eSATA drive on your network or on the Internet. You can also connect a USB printer, but only one (1) device to the port, and share it across your network using the USB Control Center software. QUICK TIP: To know more about how you can connect a USB printer through the Linksys USB Control Center software on a Windows-based computer, click here. If you are using a Mac® computer, click here instead. RESET button - Press and hold this button for 10 seconds (until the Power LED starts flashing) to reset the router to factory settings. You can also restore the router to factory default settings using the Linksys Smart Wi-Fi on the Internet or on the mobile app. Power port - Connect the included AC power adapter into this port. Power button - Press to switch the router ON or OFF.